Swiss inventor Yves Rossy flew his rocket pack to Jet Man in the same ranks with several fighters Alphajet. The flight was over the South of France. Along with Rossi, the flight went his partner Vince Reffet and Fred Fugen. 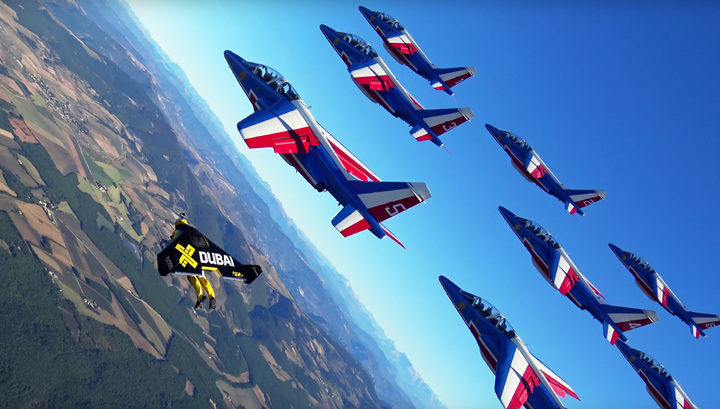 The aircraft ran one of the most experienced aerobatic teams in the world – the French Patrouille de France. Yves Rossy started developing a jetpack Man Jet in 2004. A feature of the design of the device is the lack of mechanical wing – pilot controls the knapsack using only movements of the hands, feet and head. To start the pilot Jet needs to Man up in the air by plane or helicopter. For planting, use the parachute. A jetpack can reach speeds of 300 kilometers per hour. The maximum flight time with a full tank of fuel is 10 minutes.